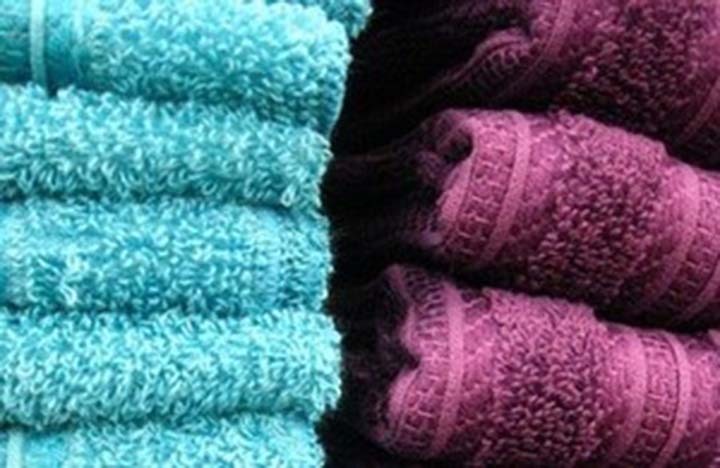 Refreshing towels – Over time, towels build up detergent and fabric softener, leaving them unable to absorb as much water and smelly. Recharge them by washing them once with hot water and 1 cup vinegar, then a 2nd time with hot water and half cup baking soda. This strips the residue and leaves them fresh and able to absorb more water again. I was especially interested in the possibilities here, because my husband uses styling wax in his hair every morning…and it doesn’t completely wash out in the shower, so it ends up on the towels…and doesn’t completely wash out of the towels in the laundry, so there is constantly a little bit of this waxy residue on the corners of our bath towels! Yuck! Needless to say, if a little baking soda and vinegar would help that, I was interested in trying it out! Well, I know those Pinterest captions are easily edited and re-pinned over and over without any checking or verification…and since the pin I kept seeing was a dead link, I searched around a little bit and found this site, which may be the original source of the pin since it has the same photo (though it does say the photo came from flickr, so who really knows!). It doesn’t give much more info than the caption above does. I was still not entirely sold that this is legit, so even MORE searching and I found this post by My Thirty Spot and this post from A Contented, Common Life. They had basically the same idea as the other two, but A Contented, Common Life added some info on the best way to dry your towels: put them in the dryer with a few clean tennis balls (new ones, not the slobbery ones that the dog chases around) to fluff them a bit – or better yet, don’t even use the dryer for your towels and line dry them. Regardless of where the tip originally came from, I decided to just go ahead and give it a try. I put the towels into the washer on hot/cold with 1 cup of vinegar (which I added it once the washer was full of water, but you could put it into the fabric softener dispenser, too – just don’t put it right in with the dry towels as it could discolor them), then ran it again on hot/cold with some baking soda (I didn’t measure it out, but it was somewhere between 1/2 – 1 cup). Remember, don’t use laundry detergent or fabric softener (that means no dryer sheets in the dryer, too!) – just vinegar in the first load and baking soda in the second. I wasn’t expecting a miracle, but to my surprise the towels did come out feeling and smelling much more fresh than they went in! They were definitely more absorbent and less grimy. The waxy residue was gone, as was the sour laundry smell. Success! I can confidently say that this tip is a WINNER…I would highly recommend trying this out – super easy, cheap, and it works! Yes! I heard about this a few years ago. When I spent a lot of money on our new towels, I vowed to wash them with vinegar every single time. It makes such a big difference! It really does make a huge difference! I’m never going back to wash them any other way! Hey girl! So glad you stopped by my blog! Can’t wait to read more from you!! Just wanted to let you know that you are a ‘no-reply blogger’. Let me know if you need help fixing that! Oo, thanks, I didn’t realize that…I think I fixed it! Thanks for the heads up! Thanks for your article, I’m going to try that too. And I recommend a drying rack if you can’t have a clothesline in the garden. That way, you can put the drying rack outside when it’s warm enough. I don’t have a clothesline, and have never thought to simply move my drying rack outside when it’s nice! Great idea, thanks for sharing Marlene! can you give me some advice how to wash new bath towels to make more absorbent and stop the shedding lint. Any suggestions on how I can do this with a front load washer? This is a trick called strip washing I learned for cleaning cloth nappies, probably why it mentions on one of the pins it came from someone’s grandma! lots of mums now use cloth again and use vinegar and bicarbonate to run strip washes to keep the cloth nappies fresh especially if they’ve bought pre loved nappies that haven’t been cared for properly. Do you do a quick wash cycle for each or full normal wash ? Seems like it would take along time to do one load of on normal cycle twice ! I have a lot of towels ???? Yeh, I have the same question? I’ve read that you can do vinegar in the wash and baking soda in the rinse. Hi. I don’t know whether anyone else has noticed their laundry smelling sour with the high efficiency washers and dryers. 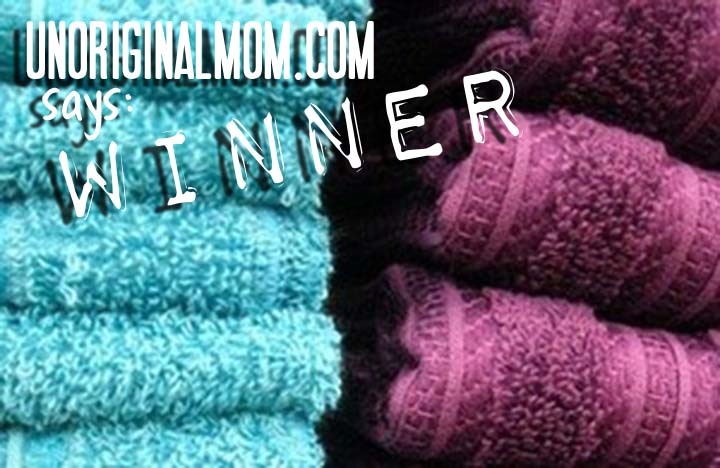 I washed my towels in baking soda and vinegar, and the result was amazing. I experimented with doing my cotton undies and tops and my husband’s boxers and socks by hand, in the sink, with several tbsp of baking soda and vinegar, together. I’ve been amazed at the built-up stuff that comes out in the water! I just rinse them in clear water and hung them on a laundry rack to dry. I must say, these clothes have never smelled and looked cleaner, colors are brighter and they are softer. I even have washed my nightgowns and let my bras soak in it, as well. I’ll never go back to machine washing of these small items and harsh detergents again. Just saying. Now for the conclusion of “Laundry of Our Lives.” First Of all, sorry I forgot to post this sooner. I was all smiles when my towels came out of the washer. Smelling wonderfully fresh and so white. Don’t know who was came up this concoction, but they are laundry “royalty.” Thank you.😀♥️👍. And Meredith you ROCK mama.